T rotary switches and P switch-disconnectors are also available for a wide range of different standard circuits and ratings. Even the number of possible switch combinations is virtually unlimited. Different designs, front plates and special switches ensure optimum flexibility to meet the requirements at hand. Furthermore, application safety is always the prime consideration in design. The covered terminals are finger-proof to VDE 0106. Like rotary switches, P switch disconnectors are manually operated switching devices without any release or switch mechanism but with a direct link between manual operating element and the contact. The contacts are positively opened on de-energization, and the auxiliary contacts are interlocked opposing contacts. 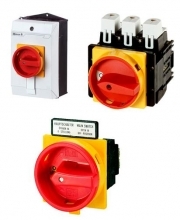 P switch disconnectors are particularly suitable as safe maintenance and repair switches or as enclosed main switches for individual electrical loads. Multiple padlocks can be connected in the OFF position. This provides a vital safety function: the no-voltage state is visible and switch on is impossible. P switch disconnectors provide reliable operation with heating and lighting systems, motors, etc. They are also suited for direct switching of motors. Selection of the switch is performed to suit the rated uninterrupted current or the motor rating in accordance with utilization category AC-23A. In applications where frequent switch on and off operations are necessary, the high switching capacity guarantees reliability. Moeller now offers T rotary switches (from 20 A to 100 A) and P switch-disconnectors (from 25 A to 100 A) conform to the ATEX directive 94/9 EC from 01.07.2003. The devices are marked with equipment designation EX II3D IP5X T90°C (Dust-EX) and are Ex-zone 22 approved for use in dust explosion hazardous areas. Processes require power. You now have these ATEX switches from Moeller to satisfy the demands of your customers with regard to main switch, maintenance switch and manual override switch requirements in their machines and systems. 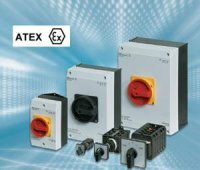 The fields of applications for ATEX switches include all manufacturing fields where deposits of dust are an issue. These include, for example: Mills, facilities where metals are ground as well as the wood processing, cement or aluminum industries.